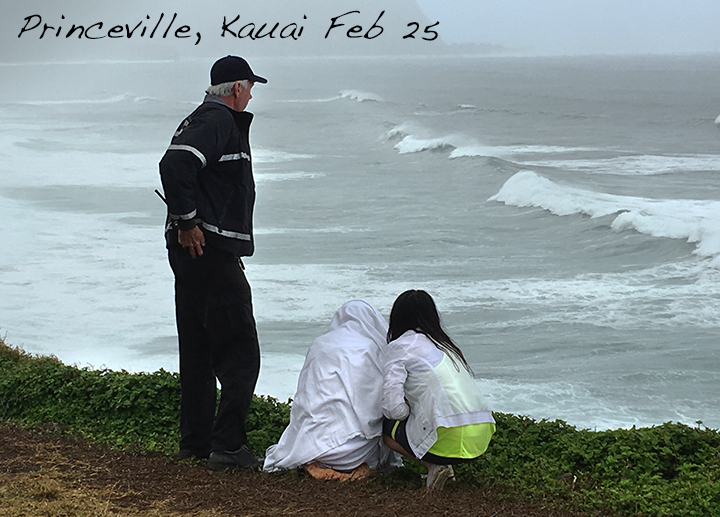 Yesterday, rescue workers searched from morning into the dark of night to find a young father from Chicago who was swept into huge waves from the notorious Queen's Bath off the north shore of Kauai in Princeville. 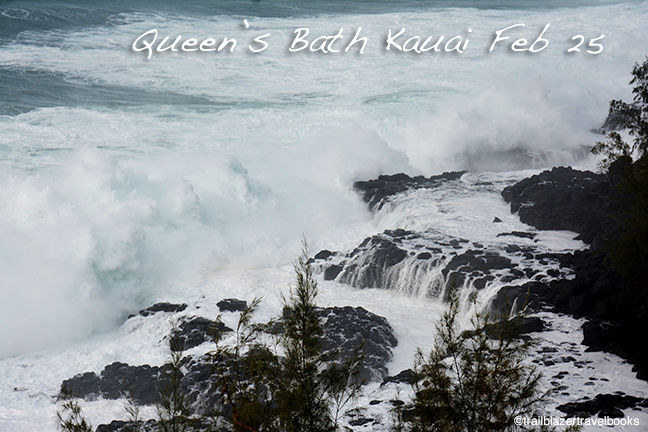 The group entered the area in spite of numerous warning signs and epic waves--up to 40 feet. The wife was crumpled in despair on the bluff above the tidal shelf all day, looking out at the violent ocean in vain. 1. Watch out for drop offs. Many ridge and coastal trails skirt sheer cliffs. Greenery along the trail disguise the hazard. Stay well back and watch the kids. 2. Stay on the trail. This maxim is to protect hikers, not the environment. The flora is way too lush and deep to cross. In places, the flora also hides earth cracks underneath that formed during volcanic activity long ago. If there is no trail, you can't walk there. If you lose the trail, retreat to a known spot. Forget about trying to go cross-country with GPS. Watch your feet and follow the trail. 3. Bring retractable hiking poles. Many trails are very steep, narrow, and slick after rains. Trails are not built on traverses like Mainland trails, but rather are there because the topography dictates the only possible route. 4. Don't cross a fast stream. 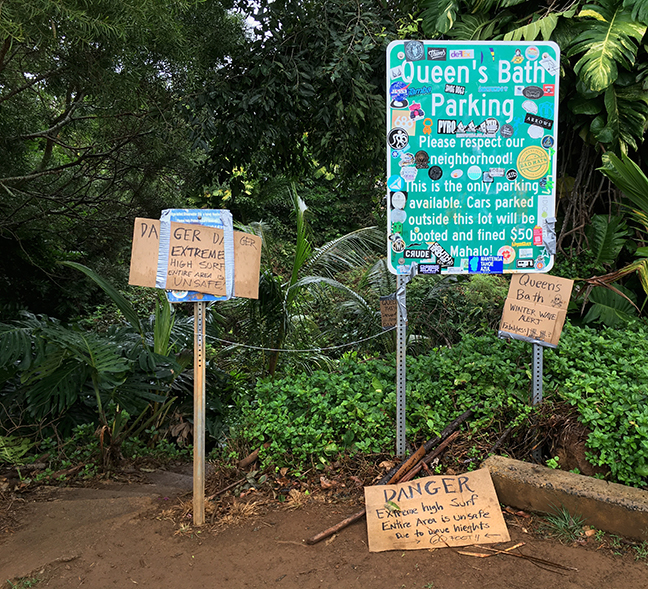 Flash floods in Hawaii have been known to cross roads and sweep away cars that attempt to cross. If you get caught on the wrong side of a stream, wait it out. The water will subside. If in a stream valley, be mindfull that fast-moving water may rise and you will have to seek high ground. During rains, staying off the trail is the best bet. 5. Don't rock climb. Even technical climbers with skill will face undue risk trying to scale rocks and cliffs in Hawaii. The ground is unstable. 6. Equip your pack. Bring a rain shell, plenty of water, headlamp, and food. 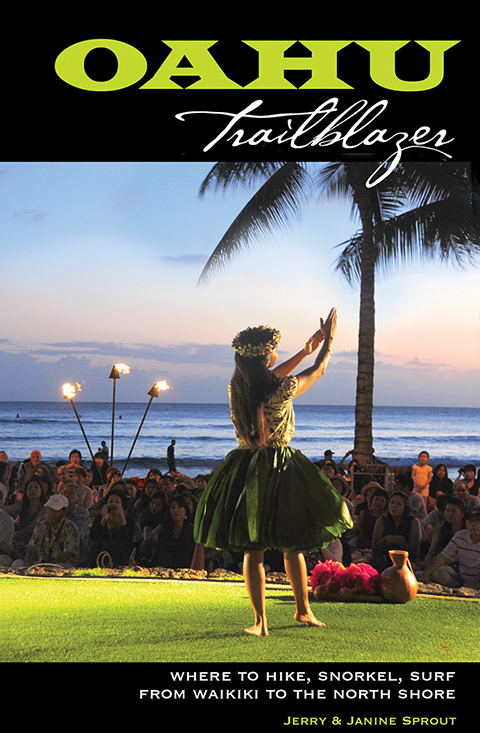 Trailblazer guides for the island have detailed chapeters on how to stay safe in Hawaii. 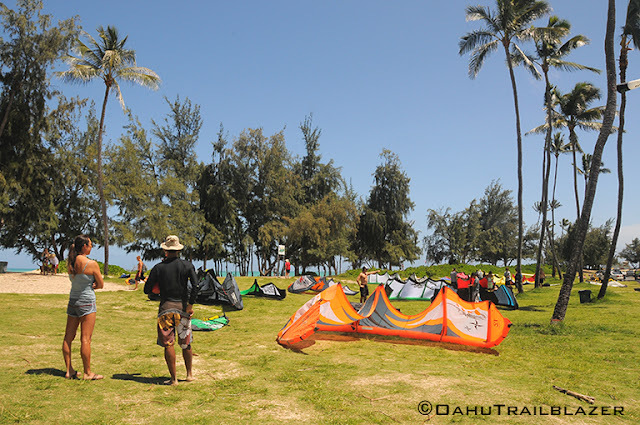 Specific precautions are given for the locale of each hike and beach. You don't need to be overly fearful of the great outdoors here—but learning how to read the risks is a must for all visitors. Afficiandos on Hawaiian fine art could search the entire state without finding a gallery like Koral and Moku's Ohana Shop in tiny Wainiha on the north shore of Kauai. And most visitors will drive right on by without knowing what they are missing. 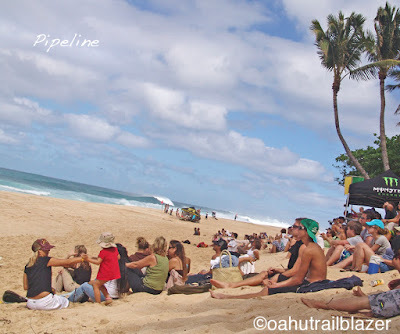 Start with the people and place: In jungly Wainiha Valley, on the other side of two one-lane bridges well past Hanalei, live pure-blooded Hawaiians who can trace their heritage back several centuries. Up this river valley until the late 1800s lived a 65-person colony of the folkloric Menehune—descendants of the Marquesans who are thought to have inhabited much of Hawaii beginning in the second century, well before the second-wave of Polynesians arrived from Tahiti nearly a thousand years later. 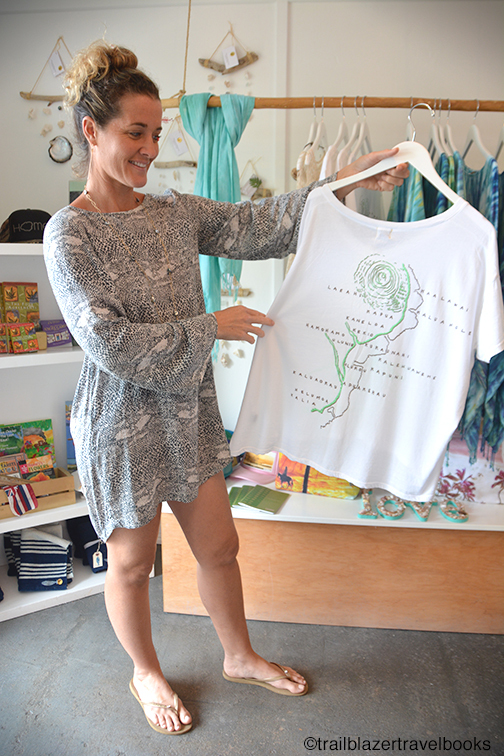 Koral and Moku, a striking couple who fittingly opened their labor-of-love gallery on Valentine's Day, both were born in Wainiha, not far from the rickety storefront (that also houses the time-honored Wainiha Store and the closet-sized Sushi Girl, which draws people from all over the north shore). 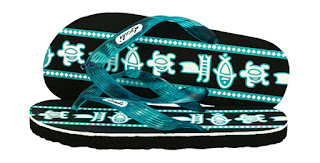 Moku is of Hawaiian descent, going way back to the ali'i (royalty). 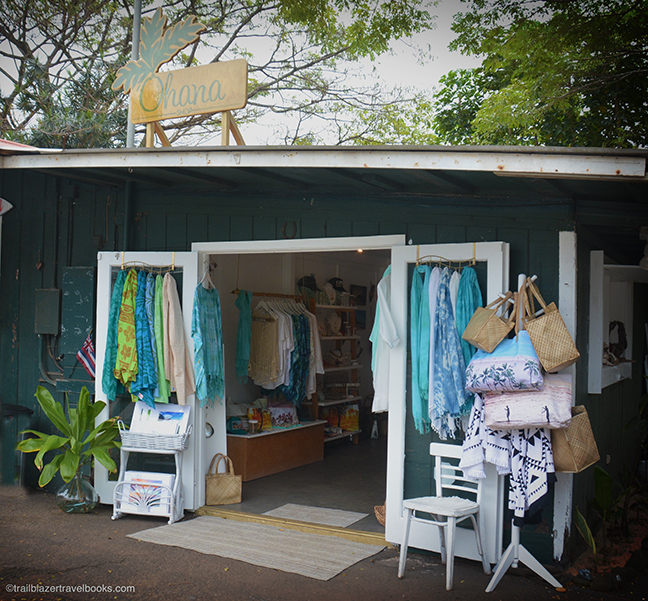 Though rooted in Hawaiian tradition, Ohana Shop's collection is a modern send-up of fine art. 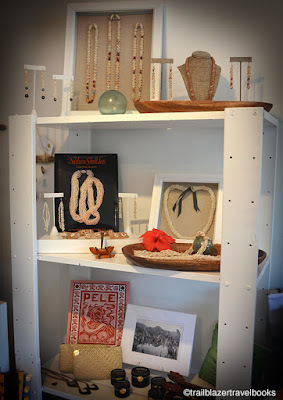 Koral has assembled the work of artists mainly from Wainiha and the north shore, but also from other connections elsewhere on Kauai, the neighbor islands, and even a few pieces from Tahiti, where she and Moku travel. 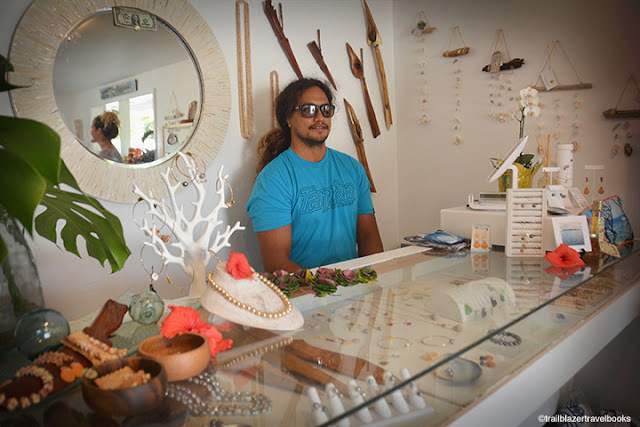 Koral's jewelry is on hand, and so are prized necklaces by native people of Niihau, hand-crafted, surreally painted mini-surfboards, photographs, paintings, t-shirts from Molokai with impressions of endangered species, and ancient-style Hawaiin spearheads shaped from native wood by Moku's father (also named Moku, who has cared for nearby Limahuli National Tropical Botanical Garden for many years). Every piece of art in the gallery has a story. 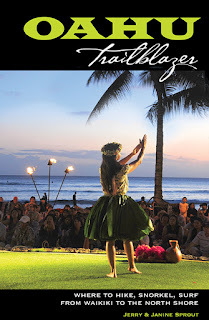 The stories combine to tell a larger story of Hawaiian tradition and this young couple whose efforts are inspired by a wish to support their friends and community. 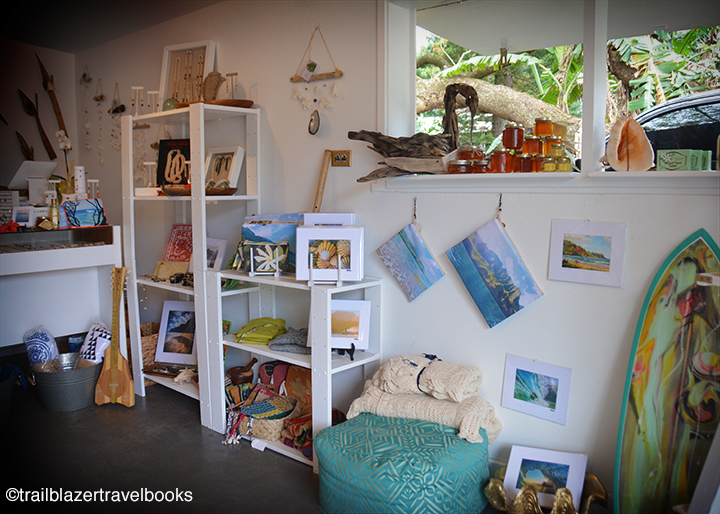 The gallery is a gift-in-waiting for all visitors to Kauai. This is the sort of gallery you may enter because you wish to support them, but you will end up buying something because the work is just plain fabulous. 1. Watch out for rogue (or 'sleeper') waves. Larger than the other waves in a given set, rogue waves knock people down at the shoreline or sweep them from a reef. 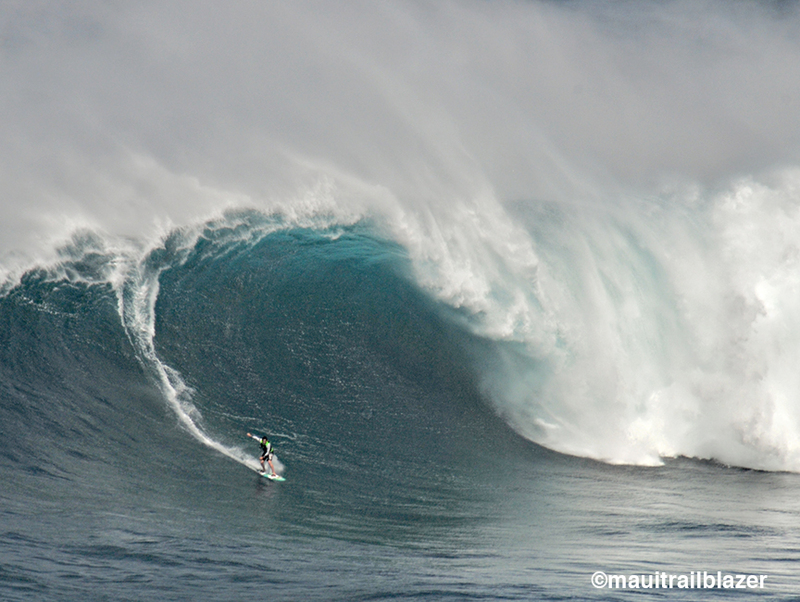 Large waves can arrive on otherwise calm days. How to avoid: Always keep an eye on the surf, since you can move faster than a wave at the beginning of its break and quick reactions save lives. When walking a beach, stay back from where the sand is wet, and same goes for reef walking, since a wet surface indicates wave action. 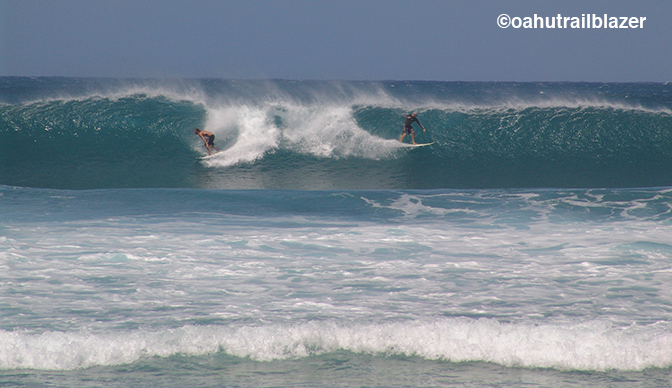 When surf is very large, stay way, way back. 2. Watch our for rip current. 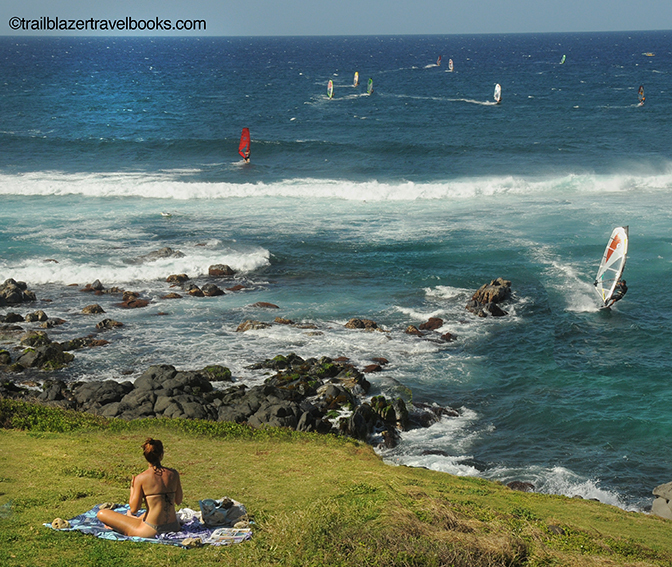 Rip current always exists when waves are present, and the higher the waves, the stronger the rip current. Rip current is where the ocean water of incoming waves is returning back to sea, usually in a channel that is the path of least resistance for the water. 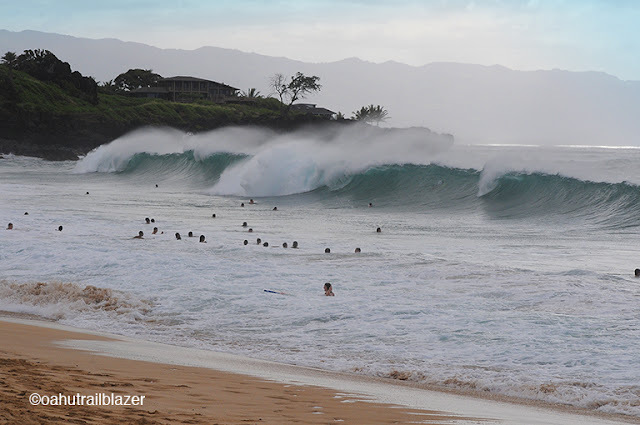 How to avoid: On beaches with reefs near shore, you can see rip current as blue channels going out through an opening in the reef, an outbound stream. On beaches with a near-shore break, rip current is visible as a rippling channel going out where waves are not breaking, or are low breaks. Indentify the channel before entering the water. Stay away from the channels. Where you choose to enter the water, throw in a stick to see which way it moves. Once in the water, look down to see if you are drifting. Swim into a slight current at the beginning, so that you will swim with it on your return. 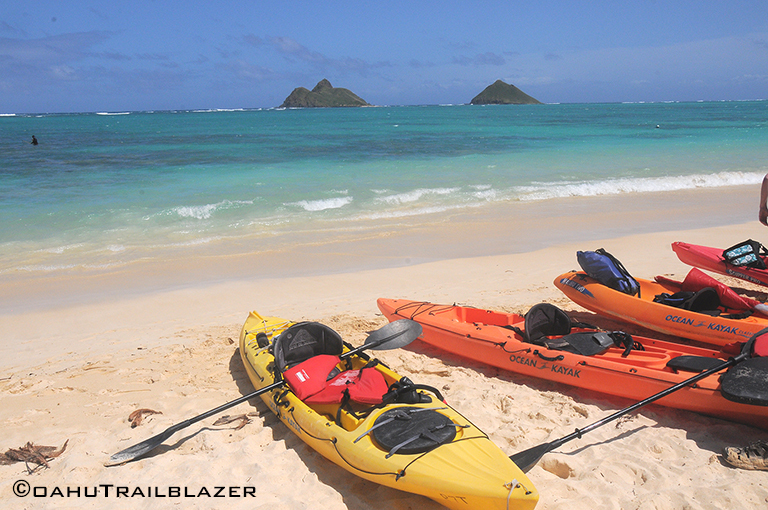 Stay close to shore. 3. Body surf or boogie board with caution. Head and neck injuries are common, especially if body surfing (which is really a lost art). Even if head injuries are not fatal themselves, they can result in drowning How to avoid: Limit your wave play to foamy waves that have already broken, or are not breaking with a curl. As a wave is breaking, look to see if sand is being sucked up at the base of the wave, an indication of a shallow water hazard. Ask advice before boogie boarding. 4. Make a smart reaction to trouble: If something goes wrong, you can still walk away safely. Many deaths occur because people make the wrong moves once they are in trouble. Have a safety plan: If two people are together, leave one person ashore to watch the swimmer (and they can also watch your stuff). Know where you are and carry a cell phone. 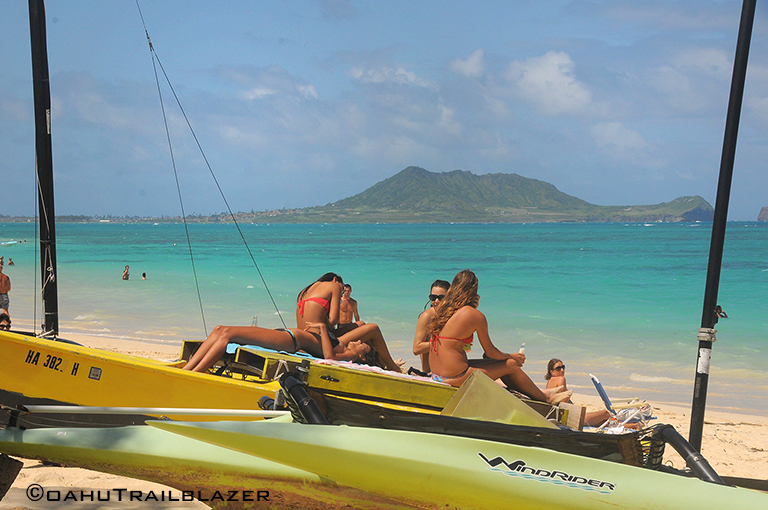 Hawaiian watermen (lifeguards) are among the best in the world and respond quickly almost anywhere on the island. Best of all (duh) swim at a beach where watermen are present. 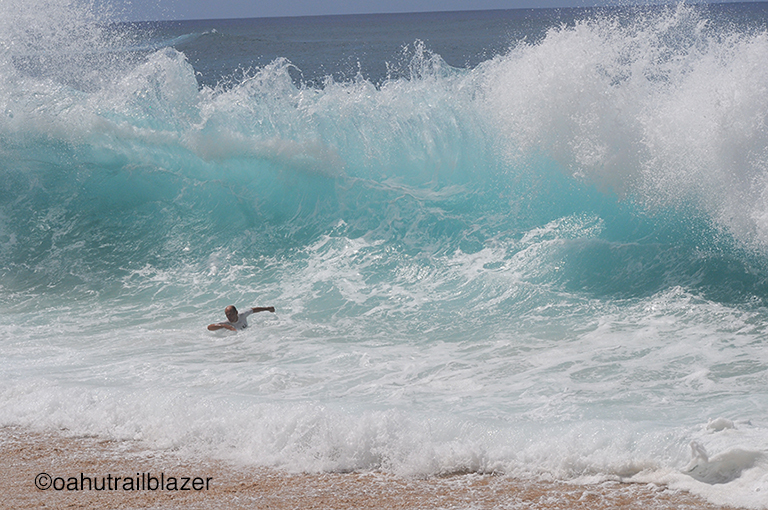 If you do get caught in a rip current, do not panic and wear youself out. 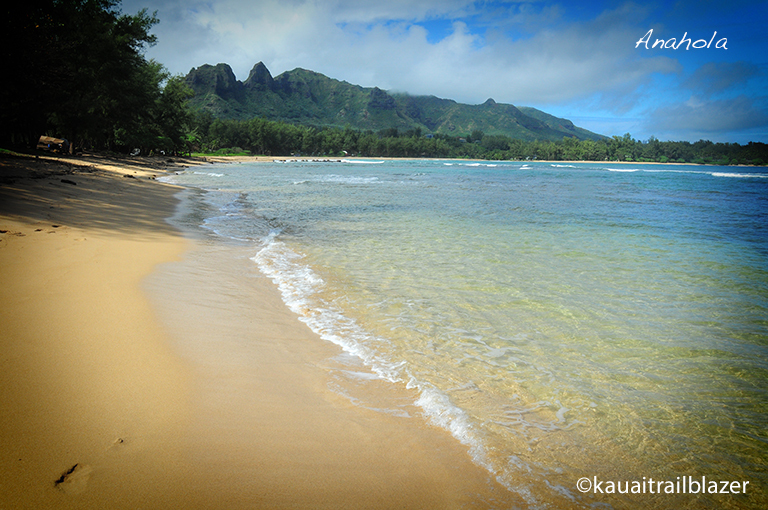 Rip currents are near-shore phenomenon, and they release you offshore. Never swim into a rip current to defeat it, but rather swim sideways from the direction of the current. 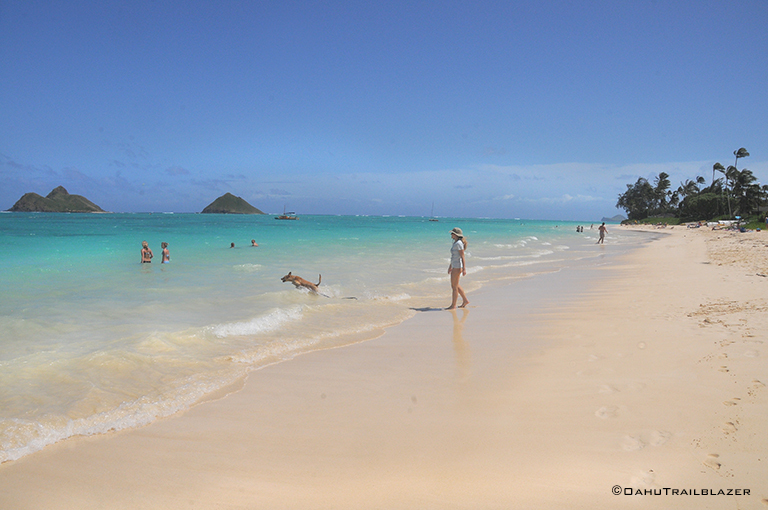 The mantra for water safety in Hawaii is: If in doubt, don't go out. Err on the side of caution. Even strong swimmers will be powerless in an angry ocean. Wearing a snorkel and fins greatly improves your safety and mobility in the ocean. 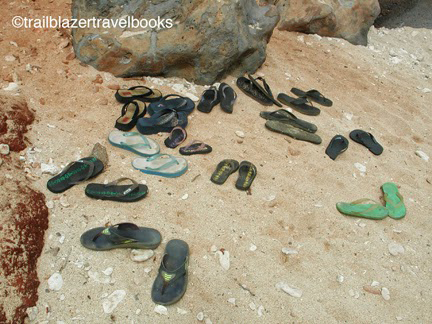 Trailblazer Travel Books (for each island) have safety tips and hazard warnings for the land and the sea. 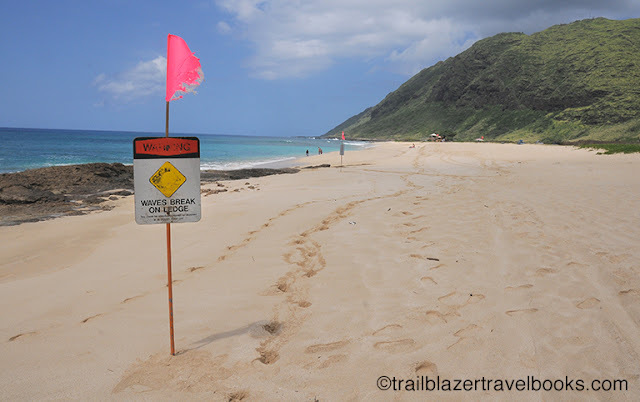 These generalized safety tips and supplemented by warnings that are specific to each beach and trail. You don't need to be overly frightened of the ocean, but give it respect.